Lethal here with a personal plea for help! Please join operation Go Green- Save A Leprechaun NOW. The Leprechaun’s life you help save WILL be mine! Things have been getting more and more tense here as the Cotton Bowl drew closer over the last week. Yesterday Molly spent all day watching pregame hype shows..shows slanted towards Alabama & their Crimson Tide I might add and giving me ever increasingly sharp looks. At the same time she was busily surfing all the college football site and consulting numerous football apps on her iPhone. That led her to three discoveries that that raised my threat level to it’s highest setting ‘run and hide until it blows over & the wife comes down’. More in a moment on why that’s no longer quite the option it was when I got up yesterday morning, first her discoveries. Notre Dame is favored, and by more than a touchdown, 10 points in fact as Impish mentioned earlier. Manti Te’o arguably Norte Dames best player this year who was in the running for the Heisman Trophy and IMO got robbed (the dude suffered twin serious personal losses this season losing his beloved grandmother the family matriarch and his girl friend with in six hours of each other but still played an amazing season under that pressure) isn’t even Catholic. He is in fact a devout Mormon. Given that when you say “Catholic College’ like the first one the pops to mind is Notre Dame this led Molly to make accusations of unreasonable recruiting and ‘packing the team’. 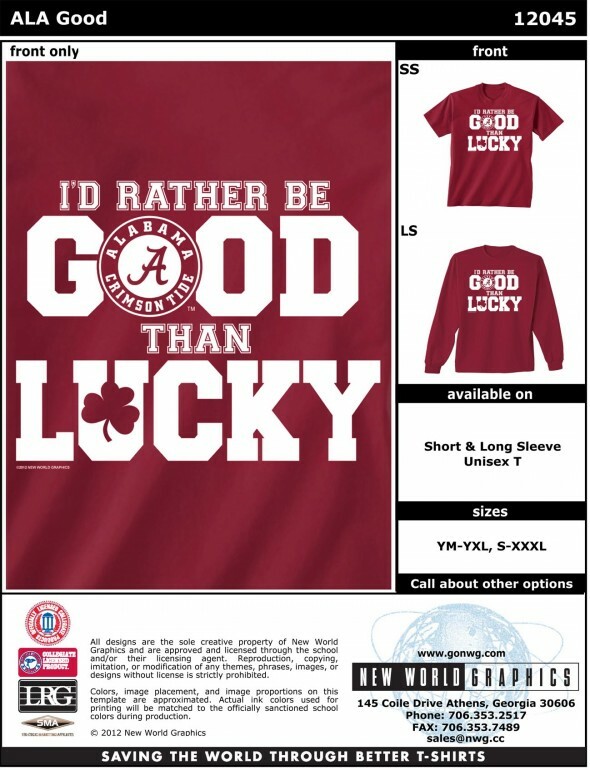 As if that wasn’t bad enough, she discovered the following trash talking Fighting Irish t-shirts aimed at Alabama. The Notre Dame Fighting Irish will be looking to win their twelfth national championship in school history and the first since 1988 when they meet the Alabama Crimson Tide in Miami for the BCS National Championship. 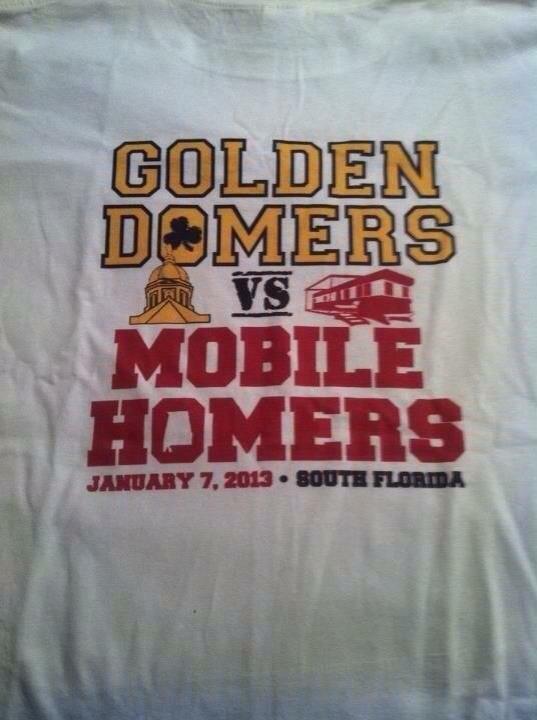 The game is set to take place on January 7th, 2013 at Sun Life Stadium in Miami Gardens, Florida, but the trash talk has already begun with some Notre Dame t-shirts that have surfaced. In a t-shirt that reads “From South Bend to South Beach” the Notre Dame faithful coin the game “Catholics vs. Cousins.” Ouch. We don’t need to get into why the t-shirt is offensive to those from Alabama and the Crimson Tide faithful, but you know we have to show off the t-shirt that will surely get ‘Bama fans fired up. While we wait in anticipation for the BCS National Championship game between the top-ranked Notre Dame Fighting Irish and the No. 2 Alabama Crimson Tide, the pre-game trash talk has been presented through the apparel for each side. We already touched on the very popular “Catholics vs. Cousins” t-shirt from Notre Dame, but the Fighting Irish faithful have unveiled yet another t-shirt that gets even dirtier than the last. I tried to point out that Alabama had almost immediately fired back with its own trash talk tee. I even conceded that there was no small amount of truth in the Crimson Tides trash talk. This got me only a baleful stare that caused frost to start forming on the walls. Earlier this month, the Notre Dame Irish fired the first shots in the war of words leading up to January 7th’s Nation Championship game against the Alabama Crimson Tide. 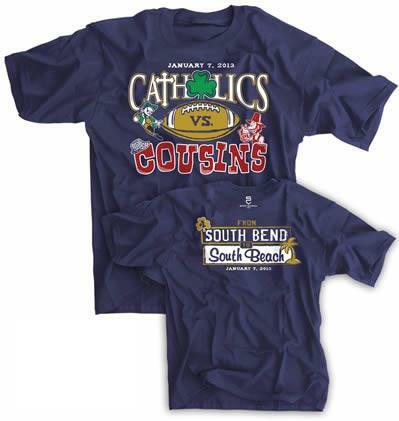 After a few days of letting the burn rub in, the Tide have answered back with a trash talk T-shirt of their own, not addressing the Catholics vs. Cousins shot, but rather exclaiming that they’d rather be good than lucky. At this point I decided discretion being the better part of valor that it was time for a tactical withdrawal to warmer and safer climes. I waited until Molly was in the shower to attempt to sneak out only to receive a text message from my flight crew that they had just landed in Alabama per Molly’s instructions and been rather forcibly removed from the plane. After firing them for being dumb enough to fly a clearly Irish favoring aircraft into Crimson Tide territory on the eave of the Cotton Bowl I realized I was screwed. All my money passports fake identities, even the Lethal Limo were all loaded on that plane and set incase I had to make a hasty departure to keep my hide and life together. Molly apparently had anticipated this tactic on my part and neatly out maneuvered me. So loyal readers I’m appealing to you for help. If things start looking bad for me ( Notre Dame is up by more than 10 at the half) I’m going to go outside to watch for the pizza dude. I’m playing for the pizza and leaving with the pizza dude to grab my go bag I’ve already stores at the place place and then a cab down the road. IF you want to help me I’ll need a bunch one places to spend a single night, or in the event of blizzards (Molly hates the cold and snow) perhaps a couple nights. If you ahve a guest room, spare bed semi comfy couch or even a heated garage/attic and an air mattress plus can show financial statements proving the large sum of money Molly will undoubtedly stoop to offering for my capture is of no real interest to you, and finally you’re not a liberal or Democrat please respond to the address on my business card below. In return I’ll cook dinner, treat you to a pot of brown gold the next morning, tell a few Irish stories and as soon as I reach a safe place send you a certificate suitable for framing including a signed picture of us to prove that yes indeed the Lethal Leprechaun has indeed slept here. If you are female single reasonable good looking and of legal age but not yet of retirement age, certain other potential benefits of my visiting you can certainly be discussed. Guys you’ll have to settle for a night of Poker, Irish Whiskey, Guinness and good cigars as the Leprechaun stays as far away from Brokeback Mountain as he possibly can. Remember! The Leprechaun’s life you help save will be my own! 1 Response to Help Save the Leprechaun! Anyone have any recipes for Humble Pie &/or Crow? Seems like I’ll be dining on both for quite some time to come. On the bright side I’ve gotten Shamrock One back intact even! A good high pressure washing followed by a very fast trip through a Thunder storm SHOULD remove all the Crimson Tide/ Bear Bryant is a Saint type bumper stickers from it sans lasting damage to anything except it’s dignity.